Throughout this program I have been able to learn that there are more than one ways to lead and advocate for the causes that are important to you and your community. The Willamette Chicano Alliance (WCA) is a community organization that was founded by students affiliated with the student group, Movimiento Estudiantil Chicano de Aztlán (MEChA). MEChA is a Chicano/Latino student group that is a product of the Chicano Movement in the U.S. and can be found in high schools and college campuses across the nation. MEChA promotes higher education, political participation, and the Chicano/Latino culture. The WCA was created with intentions to collaborate with other MEChA chapters and students across the Portland Metro Area. This organization aims to address the issue of education equity by creating programs for Latinx students in high school. The majority of WCA Staff are students pursuing Bachelors or Masters degrees of various disciplines. Currently, the organization is on track to registering as a 501(c)(3) non-profit in Oregon. TO BRING TOGETHER THE CHICANX COMMUNITY TO ASSIST, EDUCATE AND ORGANIZE. The Chicano Leadership Summer Institute began as a summer camp for students to attend workshops on the following topics: leadership development, Chicano history & culture, college readiness and community issues. Additionally, students are given the opportunity to visit local colleges/universities accessible by Trimet. For the 4th Annual Chicano Leadership Summer Institute (CLSI), coordinators will be revisiting our annual curriculum and making changes to the structure of the program. 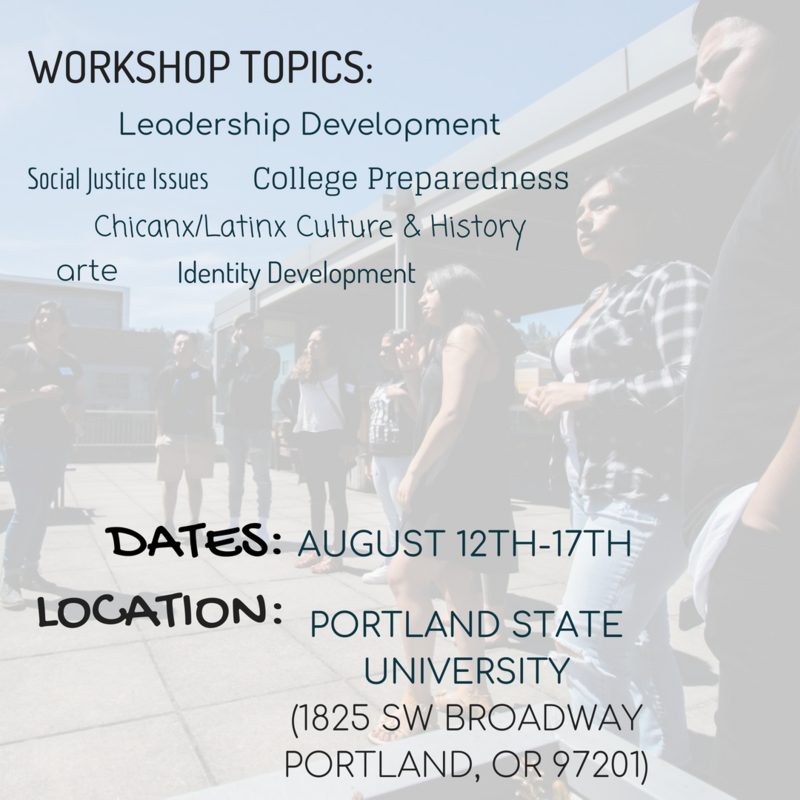 ​The Chicano Leadership Summer Institute (CLSI) partners college student mentors and high school students of the Portland metro area to the Portland State University campus. This program is supported by the Willamette Chicano Alliance, PSU M.E.Ch.A, and the PSU Office of Enrollment Management and Student Affairs. 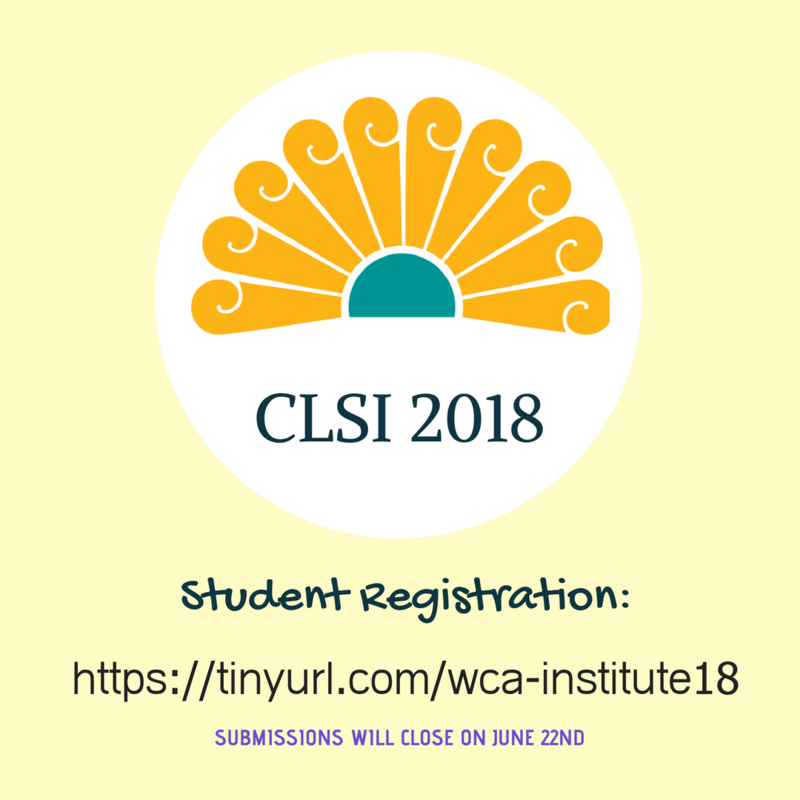 Through workshops and dialogue, CLSI participants will explore topics surrounding identity development, college preparedness, leadership development, Chicanx/Latinx culture/history, social justice issues and arte. 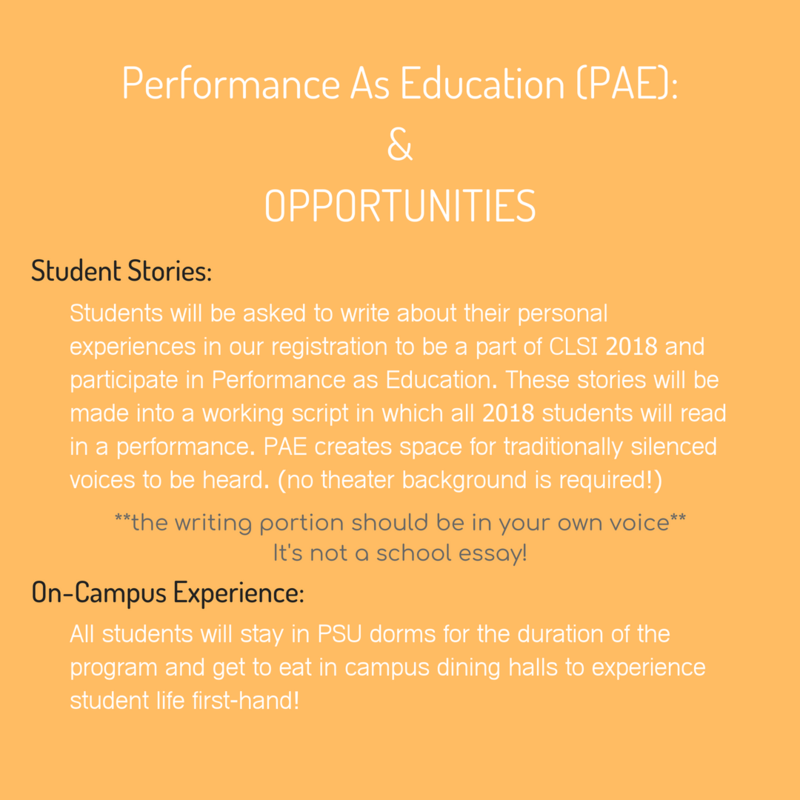 Additionally, students will also participate in Performance as Education (PAE) to provide students the opportunity to explore their personal understanding of identity. This component of the program allows students to participate in a script writing process, share their personal narratives through theater, and develop public speaking skills. With the help of the EMSA Office, CLSI students and staff will have the opportunity to stay in PSU housing and eat in dining halls for the duration of the program to allow students to experience student life for themselves. Coordinators organize the structure, program goals, curriculum and student outreach. A lot of planning and dialogue goes into simple tasks. We meet and work on tasks to ensure our students will get an autonomous experience that allows them to grow in individually in various ways. With new components added to the program, there are new skills and opportunities for learning. [above] PAE questions from the 2018 student registration. ​[right] Three 2017 students facilitating their own workshop, "Horizontal Racism," at PSU MEChA's Edúcate Conference. Their workshop aims to raise awareness of problematic issues within the Latinx community. [above] CLSI 2017 Students at PSU MEChA's 14th Annual Edúcate Conference. Dr. Elena Avilés from the PSU Chicano Latino Studies Department. Get to know the 2018 clsi Team! I find this work empowering in that it was started, coordinated, continued, and evolved by students and community members who want to see great things come of our Latinx youth. Growing up, I never had the opportunity to participate in a program like CLSI and I love that I get to bring such a great experience to other students. I like to think of this as one of my opportunities to give back to my community by incorporating some of my privileges as a college student with experiences I also connect with. I will be completely honest though, this work is so exhausting and it takes so much energy, but during and after the program it feels so great knowing we supported students. This is the 2nd year that I am given the opportunity to run this program and Becoming a coordinator for this program has allowed me to find an interest that combines my areas of study: Social Work and Chicano Latino Studies. It reaffirms my passion in both areas and really allows me to use my in-class knowledge to create a great program. My friend who first offered me the opportunity told me that I would get really attached when I first started and that it would "become like my baby." This program is a community project that really touches my heart. I don't know if I'll continue too much with this program after I graduate next spring. I like that this program has remained its main organization by college students. With the direction WCA is heading there is a possibility I can remain in this exact organization in the future but for a living. Reaching non-profit status will only allow us to grow our programs. It is really surreal that I am apart of a group of ambitious leaders helping this become a recognized organization. For now though, I'm just following my unsaid, unestablished plan of one step at a time. Thank you to all the staff and volunteers you inspire me to reach for the clouds.